Hello! Finally Autumn is here, my favourite season. So many new exciting beauty realises and collections. 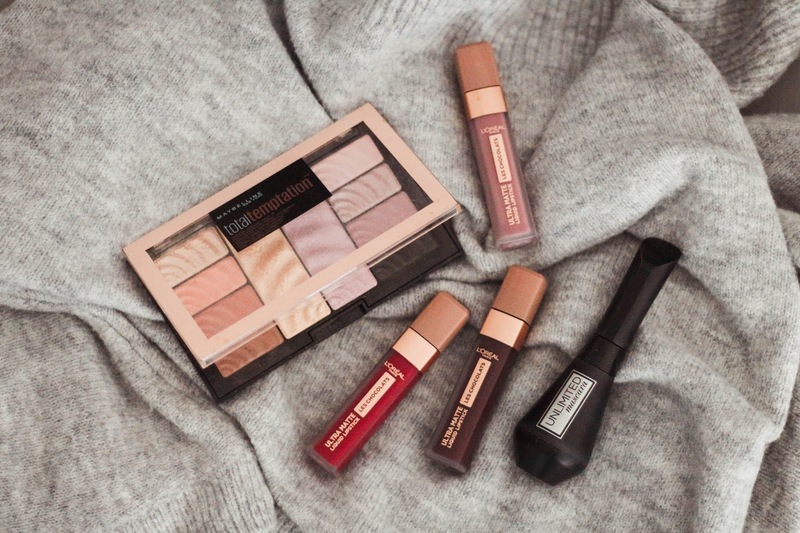 L'oreal and Maybelline are one of my favourites highstreet beauty brands, they are affordable but yet they have good quality. So today I am sharing my current beauty favourites part I because as most of us know, no girl has enough makeup. L'oreal has come out with new ultra-matte liquid lipsticks called Les Chocolates. 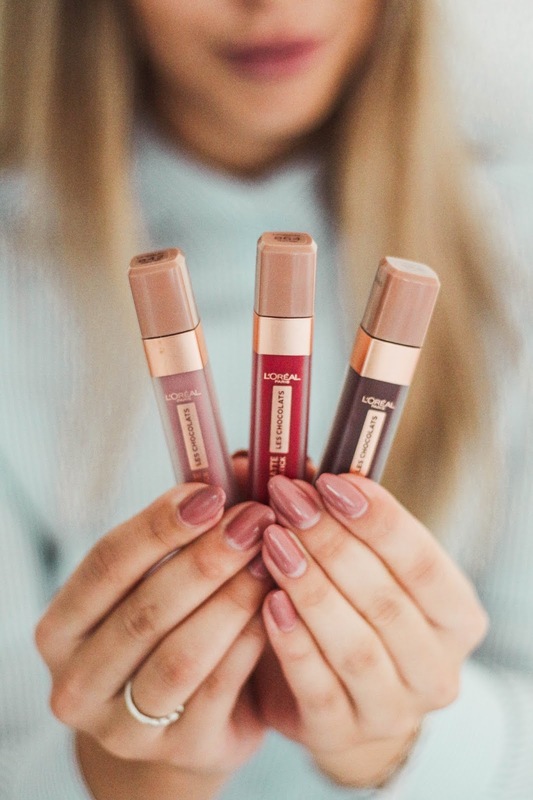 For me, a person who absolutely loves chocolate, these liquid lipsticks are just perfect. As the name already says it all, they smell like a chocolate. Les Chocolates come in 6 shades: 842 Candy Man, 844 Sweet Tooth, 852 Box Of Chocolates, 862 Volupto Choco, 864 Tasty Ruby and 868 Cacao Crush. My three favourites are Tasty Ruby, Cacao Crush and Candy Man. 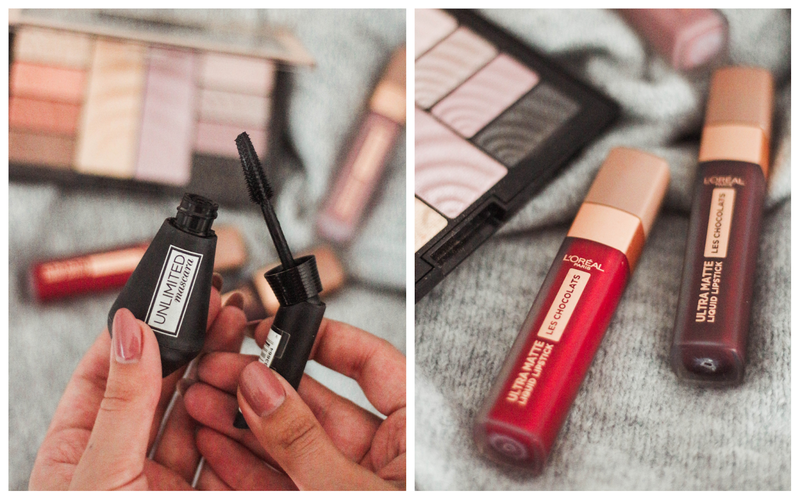 In general, I am a big fan of liquid lipsticks because they are so easy to wear and longevity is amazing, maybe one top-up throughout the day is needed, but that is all. Les Chocolates look so gorgeous on the lips, smooth and pigmented and all shades are perfect for Autumn. *On the picture - 842 Candy Man on my lips & on the eyes Total Temptation palette. Maybelline came out a few months ago with a new eyeshadow+highlight palette called Total Temptation. This palette is perfect for every day because it is 2in1. In the palette, there are 8 eyeshadow shades and 2 highlighters. Colour palette is warm and cold, which is ideal for those who want to have all in one because there is an option. Beautiful 4 warm shades, oranges and browns and pop of glitter and 4 cold tones that are lilac and kind of dark grey shade and as well one glittery shade. Longevity is alright without primes they tend to fade away. Overall, I like this palette, I can do a party look or an everyday look. Most of the times I have eyelash extensions, but recently I haven't had them because I have been using this mascara and it has made my eyelash game on another level, just to let you know, I have the shortest eyelashes. Using Unlimited mascara my lashes look so black and "long". Also, it does not smudge or flake, stays put all day long. It is not waterproof but feels like it. I love almost everything about this mascara and the thing that I do not like is that it does not come off, I have to use waterproof eye makeup remover, it would not come off with warm water or makeup remover milk. All in all, I give it 5 stars. Lash Sensational boosting serum from Maybelline has had a part in my eyelash game. As I already mentioned, I have very short lashes and if somehow I can make grow even the tiniest bit, it is a huge difference for me. I have to be honest, I was very sceptical at first, but it actually does something. I use it mostly under my mascara and sometimes in the evening after I have done my skincare routine. If you are looking for an affordable lash serum, I would recommend to try out this one from Maybelline.